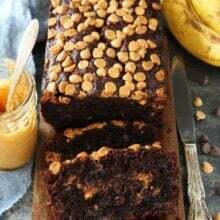 Chocolate Peanut Butter Banana Bread-moist chocolate banana bread with a peanut butter swirl and peanut butter chips on top! This quick and easy banana bread recipe is a family favorite! Oops, I did it again! I made more chocolate banana bread. 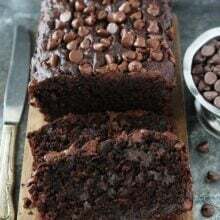 I am obsessed with my chocolate banana bread recipe, it is seriously the BEST! I buy extra bananas at the store just so I can make banana bread. I watch the bananas, waiting for them to turn brown. I think they actually take longer to turn brown if you watch them, kind of like watching a pot of water to boil. They seem to take forever to turn brown when you really want to make banana bread. 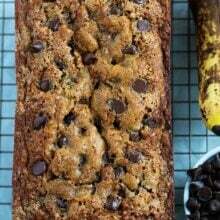 This time, I used my brown bananas to make chocolate banana bread, but I mixed things up. I added peanut butter to the mix and made Chocolate Peanut Butter Banana Bread. 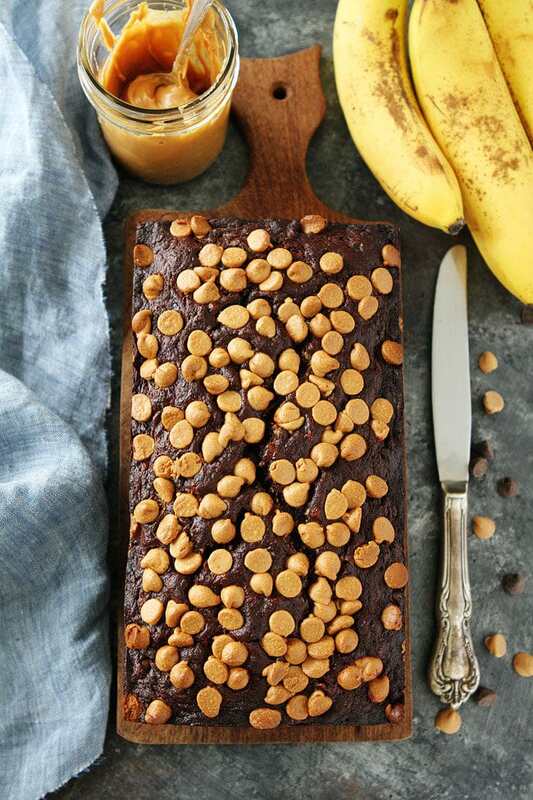 Yep, this chocolate banana bread recipe has a peanut butter swirl inside and peanut butter chips on top! 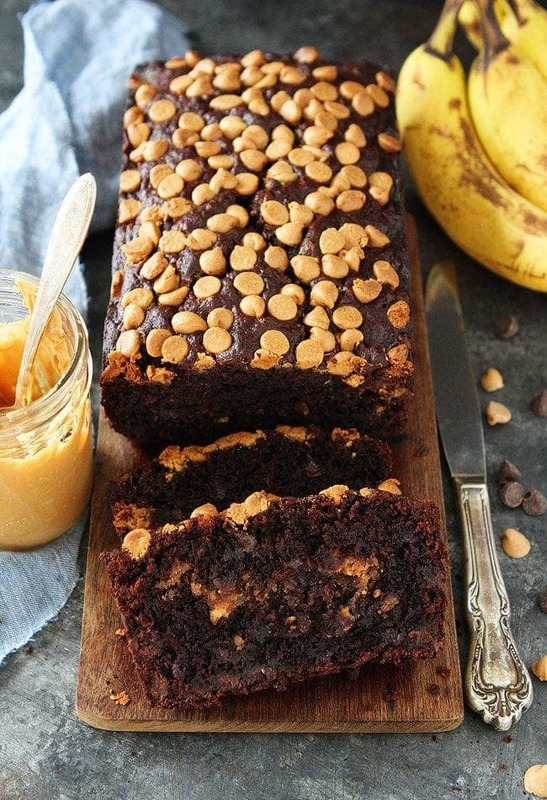 It is a chocolate peanut butter lover’s DREAM banana bread! 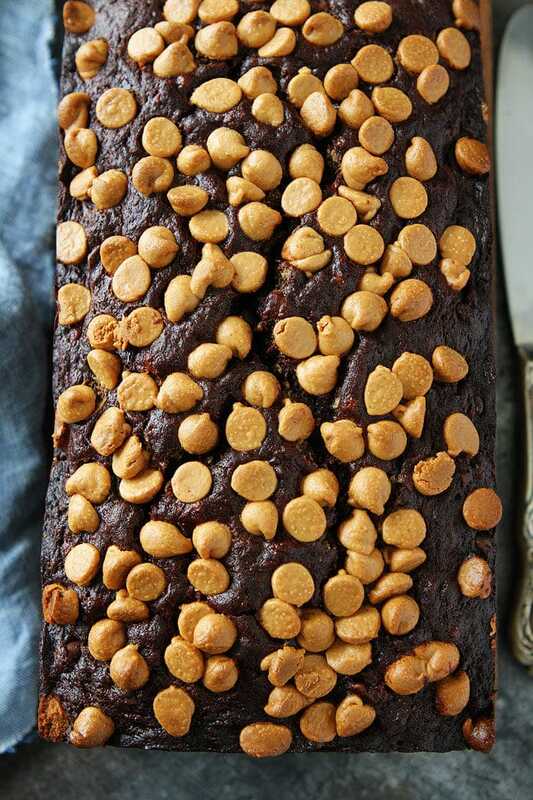 I was super excited to invite peanut butter to the chocolate banana bread party because chocolate and peanut butter are a match made in heaven. I knew the peanut butter addition would be good, but I didn’t know it would be eat the whole loaf good. You think I am joking, but I really went to town on this loaf of banana bread. The boys helped me a little, but I kept eating slice after slice until it was gone. 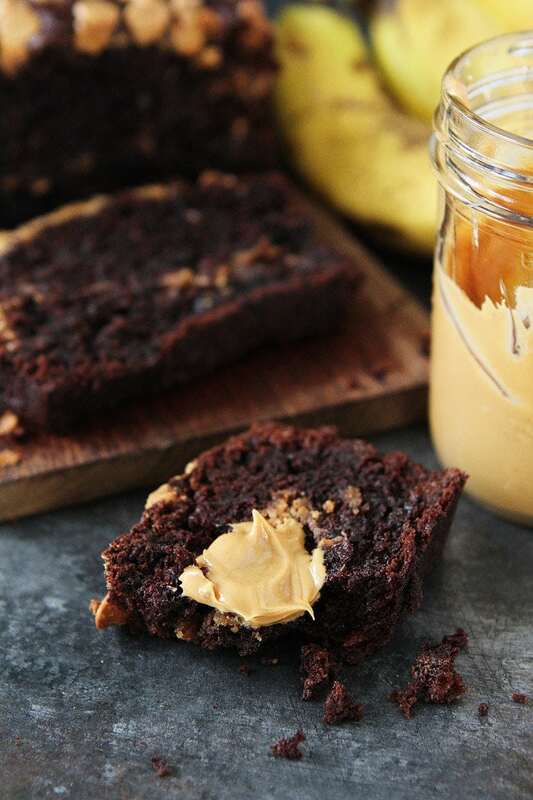 The chocolate banana bread alone is absolute perfection, but when you add in a swirl of creamy peanut butter and peanut butter chips on top, talk about trouble. I couldn’t stop myself! I like to go the extra mile and slather peanut butter on my slice. Mmmmm, so good! So, I’ve made Chocolate Banana Bread, Gluten-Free Vegan Chocolate Banana Bread, and now Chocolate Peanut Butter Banana Bread. I think I need an intervention. 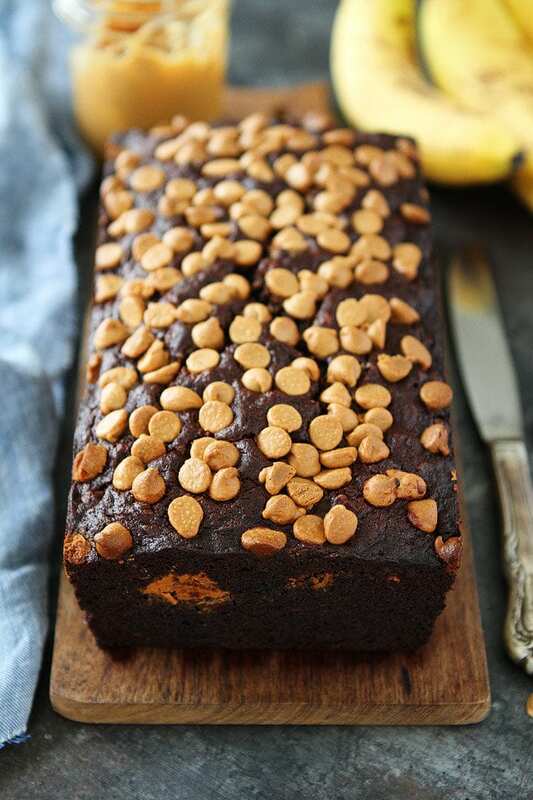 The next time I bake a loaf of chocolate banana bread, please come help me eat it! And which recipe is my favorite? I know you are going to ask…whatever banana bread I am eating at the time. They are ALL so so good! I am going to watch my bananas now. I need them to turn brown so I can bake another loaf. And make sure you check out How to Make the Best Banana Bread, if you want a classic recipe! It’s a winner! 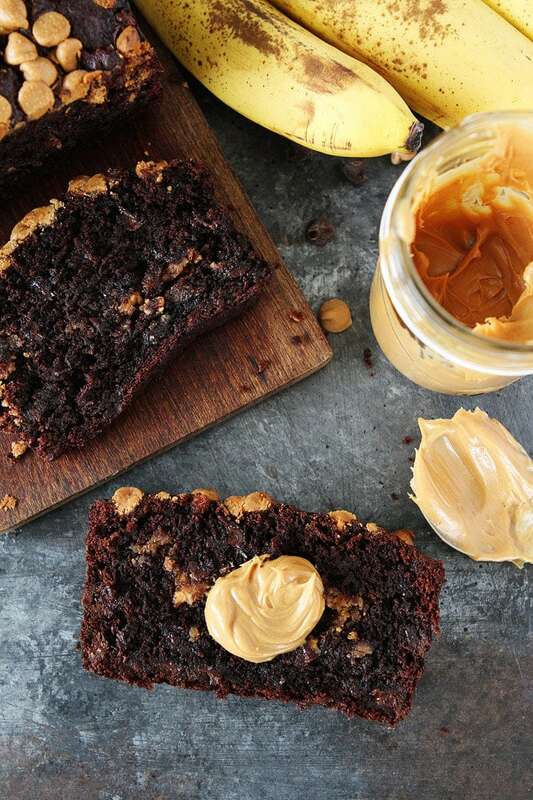 Moist chocolate banana bread with a creamy peanut butter swirl and peanut butter chips on top. Slice and serve with a cold glass of milk! Heat your oven to 350°F. Grease a 9-by-5-inch loaf pan with nonstick cooking spray and set aside. In a medium bowl, whisk together the flour, cocoa powder, baking soda, and salt. Set aside. In a large bowl, mash the ripe bananas with a fork. Add the melted butter and oil and stir until combined. Stir in the brown sugar, egg, and vanilla extract. Stir until smooth. Stir the dry ingredients into the wet ingredients, don’t overmix. 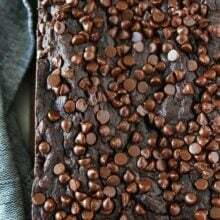 Gently fold in the chocolate chips. Pour half of the batter into the prepared loaf pan. Drop spoonfuls of the peanut butter on top of the batter. Swirl the peanut butter into the chocolate batter with a butter knife. Top with remaining chocolate batter. Sprinkle the peanut butter chips over the top of the bread. Bake for 60-65 minutes, or until a toothpick inserted into the center of the bread comes out mostly clean, you might have some melted chocolate chips or peanut butter on the toothpick and that is fine. You just don’t want a lot of gooey batter. Remove the pan from the oven and set on a wire cooling rack. Let the bread cool in the pan for 15 minutes. Run a knife around the edges of the bread and carefully remove from the pan. Let the bread cool on the wire cooling rack until slightly warm. Cut into slices and serve. Note-the bread will keep on the counter, wrapped in plastic wrap, for up to 4 days. This bread also freezes well. To freeze, cool the bread completely and wrap in plastic wrap and aluminum foil. Freeze for up to 1 month. Defrost before slicing. Now this is how to do banana bread! I’d like to try this with a Nutella swirl instead of straight peanut butter! Well seeing this recipe has brightened up my day! Thanks guys! Our family loves banana bread! This is a great picnic treat! Wow… I am a true fan of the chocolate and peanut butter combo. Can I hug it? (Just kidding.) But I’ll take a slice…or two…or ten. This bread looks amazing! I need it in my life! hey girl- this bread looks so good! YUM! It doesn’t get much better than chocolate and peanut butter! I just made two loaves tonight. I can’t wait to try them!!! Ok, this bread is the bomb!!! I had some last night soon after I took it out of the oven. What a treat!! Since I made two loaves I brought some into work and my coworkers and loving it!! Its a nice Friday treat for coworders!! So happy you like the bread! I made this yesterday and it was OH SO GOOD! 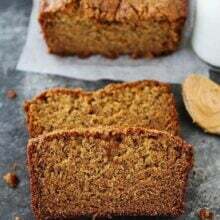 My kids and their friends love banana bread, and this will be my go to recipe for a while. I didn’t have the peanut butter chips, but it was perfect without them! Made this tonight. So delicious. Very moist. Slices broke apart in the middle peanut butter spots so didn’t really hold together. Didn’t have peanut butter chips so made a crumble topping (flour, brown sugar, peanut butter and butter). Thank you for the recipe. Hello!! I am so excited to try this, I think it will be perfect for my boyfriend’s birthday!! Do you think it would work in cupcake form? If so, how would you adjust the baking temp/time? Thank you so much as always for your lovely recipes!! This looks amazing! I would like to make it in mini loaf pans for holiday gifts. How should I adjust baking time? Thank you! I would bake for half the time and check them! Thanks for this wonderful recipe. A friend requested a bundt cake with peanut butter and bananas and this totally satisfied her craving. And after taking the recipe to the office there have already been numerous requests for it. I’ll certainly be making it again. This looks really good and I can’t wait to make it. Can I use chunky peanut butter instead of smooth? This takes no where near 60 mins! Seemed done at 30 but I kept it in as per instructions. Completely burnt! Hi what I can I substitute Dutch process cocoa powder with .. as I can’t find it in our local stores . regular unsweetened cocoa powder is fine. That looks amazing! I am trying it tonight! Do you use natural peanut butter or does it need to be the Skippy/Jiff kind? Thanks, yum!! Just making this now! Smells delicious! I’m sure my grandsons are going to enjoy it! Very good. Was a bit crumbly when we cut into it but we might not have let it cool long enough – smelled too good. Used regular creamy adams peanut butter, which is salted. Would use unsalted next time, it was a bit too salty for our tastes. I was in a hurry, so we turned it into mini muffins and regular sized muffins (baked at 20-25 minutes). They were delicious, and my kids loved them. Though, fair warning, turning them into mini muffins throws off the proportion of peanut butter mixed in and can make them very sticky in the mouth. That said, the overall flavor is fantastic, and my kids are already asking me to make it again! This recipe was very easy to make however it didn’t taste as good as i thought it would, a great idea it just needs some fine tuning to get that perfect mix between chocolate, peanut butter, and banana. Keep trying! First time making banana bread and this recipe is AMAZING!!! literally the best I’ve ever had!! Just wondering though, mine turned out extremely moist and it falls apart when I slice it. I followed the recipe to a T. Do you think I need to bake longer? Or try a little less vegetable oil? I’m going to buy more bananas immediately so I can make loaves for my family!! Very good! Didn’t swirl peanutbutter but rather added to batter,also swapped half the oil for applesauce and added approx 1/2c milk. Needed to bake 70min. Very nice texture and very moist. also made mini loafs and baked for approx.40minutes. I just made this! I only put 1/3 cup cocoa, and I incorporated some peanut butter in the mix and did a ribbon of peanut butter along the bread so every piece would have peanut butter! It’s smelling amazing in the oven! I can’t wait to try it! So good! I loved this recipe so much I’ve made it twice this week.